Mouse and keyboard? Bah. Midi controllers? Yawn. Learn how to control visuals in a Unity3D to Resolume pipeline using a light sensor, a cardboard box, a banana. 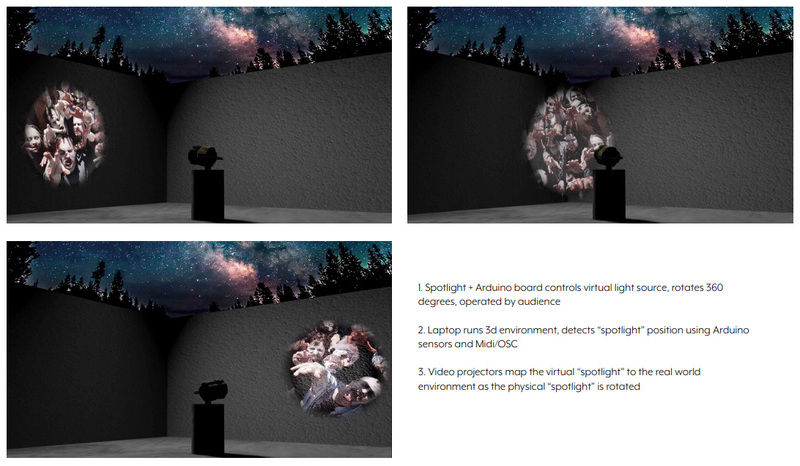 Modern video installations use all kinds of input devices to allow for dynamic performance and audience engagement. More often than not they involve architectural mapping, generative art, game engines. This workshop is a walkthru, from concept to completion, of how to build an interactive 3D environment into the commonly-used VJ software Resolume. We’ll use the open-source microcontroller Arduino to handle input parameters from non-standard sources… in this case, a banana. Maybe a potato. Maybe a cardboard box. Who knows? It depends on what we’re having for lunch. Eric Medine is a multimedia and video artist with a BFA from the School of the Art Institute of Chicago and a MFA from the the Otis School of Art and Design in Los Angeles, California. He has shown work in galleries and museums such as the Track 16 Gallery in Santa Monica, Walled Cities Gallery in San Pedro, Andrew Shire Gallery, the Museum of Contemporary Art in Los Angeles, xm:lab and the KuunstlerHaus in Germany, Los Angeles Contemporary Exhibitions, the Chicago Motion Graphics Festival, Fêtes des Lumières, and the LPM festival in Rome and Mexico City. As a VJ and live visuals engineer with TenTonRaygun he’s worked with performers such as Major Lazer, Meat Beat Manifesto, the Orb, Batchass, Lila Downs, Infected Mushroom, Excision, Wet Mango, Trash 80, Dan Wilcox, MegaRan, and Grammatik. from unity3d.com: “The Unity Editor is a creative hub for artists, designers, developers and other team members. Available on Windows and Mac, it includes 2D and 3D scene design tools, instant play mode for rapid editing and iteration, and a powerful animation system.” Basically, it’s a pro-sumer game engine. I like it because there’s a huge community for it– any problems you’re having with your build, someone has already fixed it (probably). You can download a full featured version, Pro versions have more robust network and version tracking support. Resolume.com is a video mixing software program with a ton of features– pixel mapping, DMX control, video mixing and playback, and various types of plugin support. You can download a full featured (but watermarked) demo version. Spout is a realtime video sharing framework for Windows. Senders and receivers include FreeframeGL plugins, a Java interface for Processing, Jitter externals for Max/Msp, VIZZable, modules for Ableton Live, and a Virtual Webcam as a universal receiver. There is also example code for creating your own applications with openFrameworks and Cinder. Now these applications running on Windows can share video with each other in a similar way to Syphon for OSX.